Welcome to August, Haymeadow residents! Just because summer will be drawing to a close doesn&apos;t mean there aren&apos;t still plenty of activities to enjoy here in Central Illinois! 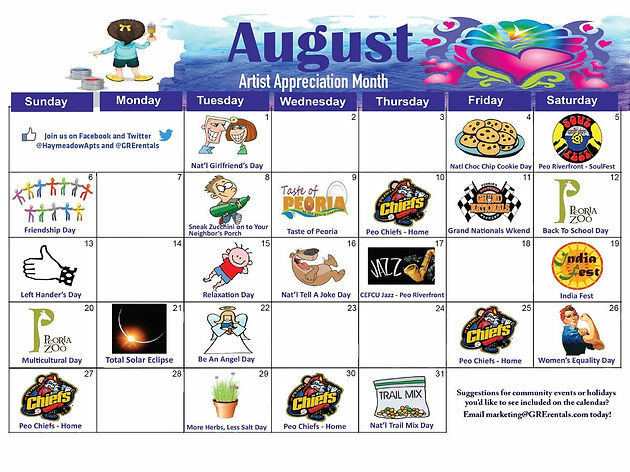 The Haymeadow Apts August Calendar of events is HERE! Make sure you keep a copy handy so you will know at a glance when "National Girlfriend&apos;s Day" is or that we are giving away FREE COOKIES on "Chocolate Chip Cookie Day"! From local events, to holidays (National and "silly" ones) you can keep..."up to date"! (pun intended)Enjoy!